Serve juicy lollipop lamb chops with plenty of napkins. Lollipop lamb chops are lamb chops with enough meat and fat cut away to reveal the bare rib bones. The flavorful little chops are easy to prepare to perfection in the oven or on the grill, and you can use the bone as a handle. 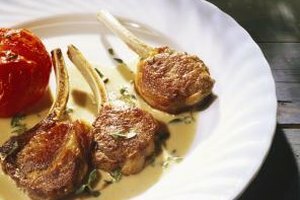 Because lollipop lamb chops tend to be expensive, they are often reserved for parties or special occasions, where they are the star of the show. For the best texture and flavor, use a meat thermometer and don't overcook these succulent little chops. Remove the lollipop lamb chops from the refrigerator and sprinkle them with salt and pepper. Let the lamb chops warm to room temperature while you preheat the oven to 350 degrees Fahrenheit. Heat a small amount of cooking oil in an ovenproof skillet. Place the chops in the hot oil and cook them for about a minute on both sides. Transfer the browned chops to the oven. Cook them for 12 to 18 minutes, or until a meat thermometer registers at least 145 F.
Place the lollipop lamb chops on a plate, then let them stand for at least 3 minutes before serving. Place salt and pepper in a blender or food processor. You can also use a mortar and pestle. For the best flavor, use coarse salt and fresh peppercorns. Pour in a small amount of olive oil, then add your choice of fresh herbs, such as rosemary, parsley or thyme. If you like garlic, add several cloves. Blend the ingredients into a thick paste. Rub both sides of the lollipop lamb chops with the paste, then place the chops on a baking sheet, in a single layer. Cover the chops with plastic wrap, then let them stand at room temperature for 30 minutes. Place a rack about 6 inches from the broiler. Preheat the broiler. Broil the chops for 2 minutes, then turn them with tongs and broil the chops for an additional minute, or until a meat thermometer inserted into the thickest part of the chops registers 145 F.
Transfer the lollipop lamb chops to a plate and serve them hot. Preheat the grill to medium-high. Brush the grate lightly with cooking oil to prevent sticking. Brush the lollipop lamb chops lightly with olive oil, then sprinkle the chops with salt and pepper. 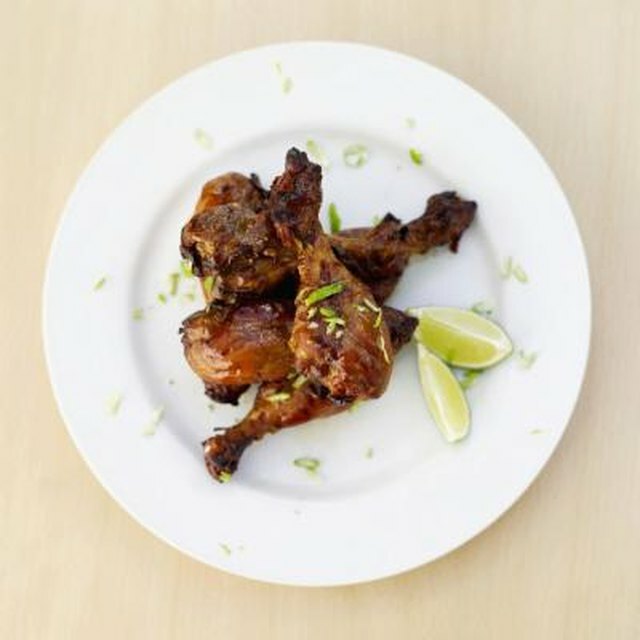 Coat the chops with barbecue sauce, or make a syrupy glaze by simmering fruit juice and brown sugar in a saucepan. Grill the chops to the desired level of doneness, about 3 to 5 minutes on each side. Place the chops on a plate. Drizzle them with extra sauce or glaze, or serve sauce on the side for dipping. To test the temperature of thin meat cuts such as lamb chops, insert the thermometer into the side of the chop. Be sure the tip of the probe isn't touching bone.